@Alexandrine what's going on between them? why letizia acted in this way towards sofia at a PUBLIC event? is there some apparent reason for letizia's behavior? was going on some gossip in spain recently re:letizia and sofia? I am so disappointed with Letizia... but a lot more with Leonor, that gesture is very bad!!! Ok first of all Im biased in the sense I dont like Leti, second Ive been following these two for as many years as the cambs. This is not the firat time it happens. Sofia and Letizia had had fights in public in the past. More obvious or less obvious. Especially since Leti is queen she likes to do her thing and ignore her mil. So the interesting thing is that they wanted this moment to be known and that journos start saying between lines things. This more or less happened in 2013 when Felipe and her had a big crisis and some of us thought divorce may happen. It didnt. This time may be quite similar in that sense. That it could be the beginning of the end of her but Felipe must think she may be worse outside his influence and cause even a bigger crisis so who knows. Even JC supposedly said in that moment to Felipe something like I hope he can have calm moment in the future talking about divorce. I intensely dislike Letizia. What she's done is despicable and the attitude her daughter Leonor had, doesn't exactly compliment the upbringing she's alledegly been given. She also wiped Leonor's forehead after Queen Sofia gave her a kiss. In my opinion this would be as bad as Harry or William throwing their arms away from Queen Elizabeth or from the Duke of Edimbrugh. As bad as Kate stopping the press from taking a picture of them with the Queen, Prince Phillip or Charles, a photo any of these three people wish being taken and wiping her child's forehead after they've been given a kiss by any of the former. It's despicable, classless, rude and sets a very bad exemple. It allows and enables Leonor to have a terrible attitude. Letizia is alledgely worried about her daughter's image, well acting like this and allowing Leonor to aggressively remove her grandmother's hand from her shoulder is a sure path to criticism. Letizia is mad that Queen Sofía invited her daugthers (even Cristina) to a mass to honour the anniversary of the passing of King Juan Carlos' father, the Count of Barcelona. Who the heck is Letizia to allow or think she has any right to agree that a grandaugther, a princess of the blood, honours her grandfather? I'm with Marie-Chantal on this one, Letizia's shown her true face. She's vulgar. There's rumours that Felipe and Letizia aren't getting along and a divorce might be coming. Letizia had no excuse; Sofia is the Queen Mother of Spain and Letizia was out of line. I hope there is a divorce and I hope Letizia gets little in the settlement. She earned every last one of those boos she received. She deserves all of them and like we say in Portugal, she needed a lot more, and its a shame all the boos than fell on the floor (this means all that were not given)! I hope there is a divorce and I hope Letizia gets little in the settlement. ^Very stupid damage control, IMHO. The fake smile on Letizia's face isn't fooling many of us. ^Or a day of shopping. ^That pink dress is pretty but appears too tight up top. Not a fan of the outfit for the 2nd day. 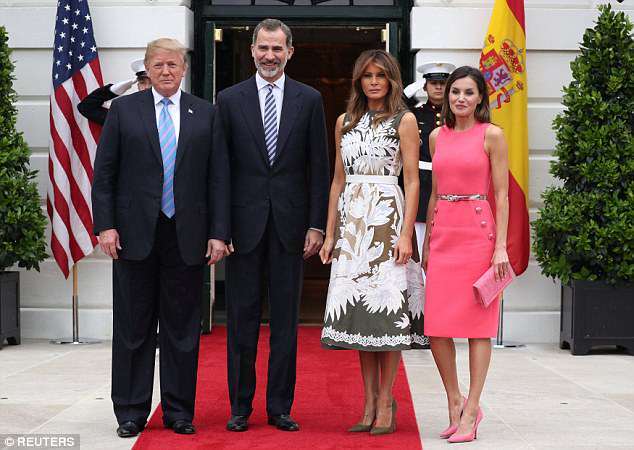 Darn, I'm an American and I didn't know that Trump was hosting King Felipe and Queen Letizia. Letizia looks good in pink. I miss sleeves in dresses, though, it looks unprofessional without them. Not to spiral this into politics, but I have the impression that maybe media isn't reporting on this unless Trump sets a foot wrong, and him pouting would off-set many channels and they'd report that and sweep under the rug that it was a state visit by the Spanish crown. Then again I don't know how closely you follow media, you might simply not follow too closely and it's easy to miss things then..
^ and ^^ Agree with both of you about sleeves with dresses. I hope they'll come back someday! I'm American and hadn't heard about this visit either. I think you've got it right HRHOlya. The media won't report unless Trump makes a mistake. We also have a lot going on in politics and governing these days, so it's easy to skip reporting on this. I follow politics everyday, because it's just as entertaining as the BRF lately, but the American media's focus has been the whole "Trump is separating children from their parents at the Mexican border" for the past two days and no one, not CNN, Fox News or MSNBC has mentioned the King of Spain's visit.